IF YOU ENJOYED THIS VIDEO ON HOW TO BUILD RENTAL APARTMENTS PLEASE SHARE IT ON SOCIAL MEDIA AND LEAVE A COMMENT BELOW! Please be assured your valuable info will be examined fully. Great presentation and content. Well worth the time. Thanks! We are glad you enjoyed the presentation! To answer your question, our software does not locate properties for you, it is essentially used to analyze potential deals and then create reports to wholesale the property or secure lenders. It has the option of either Fix & Flip OR Fix & Hold. These are for deals that use short-term financing or cash up front (less than 24 months). If you have any more questions, feel free to email our support at support@rehabvaluator.com. Thanks! Daniil, Do you have basements? Your thoughts on 10 feet foundations. What are the criteria and metrics to look @ to see if building rentals is viable in my area? Also, is it recommended to have a business plan to give to a bank for funding? Thanks for all the great free info Danil! I’ve never presented an actual business plan to a bank, but it probably won’t hurt. As for the metrics, I discuss that in the video in detail, unless I’m missing something? That is a very subjective question. Architect fees vary widely based on the cost of the project and what type of project it is. However, it’s usually a percentage of the construction cost. A very standard rate is 10% of the construction cost but it can vary from 5% to 20% depending on what is to be done. For construction permits and zoning issues all of those permits, applications, etc. have different fees from city to city. You’ll need to check with the municipality or county you live in to find out those costs. That’s not a company I’m familiar with so I couldn’t really say. Great info Daniil as usual i am learning a great deal of info and with your software RV I will be doing projects in the future. George. Thanks for your comment, but you’re wrong. As the market cap rate for the property rises, it’s resale or market value decreases. Do some research to properly understand how cap rates work and you’ll see that I am right. Do you have a program looking for land, for some one to buy? Howrd – are you asking if we have a course on buying land? Not at this time. Or am I misunderstanding your question? I have done a rough rehab cost and came up with $60,000. The comps in the area are around $240,000. I had mentioned to the owners son a tentative offer of $150,000. What is a good bank to use? Usually local credit unions are the way to go. They have more of an interest in investing in your local community. I did enjoy your presentation. Good stuff. Last place I built cost $65/ft. To each their own, John. Many of our tenants love the look! On behalf on Daniil and the entire team here you’re very welcome! 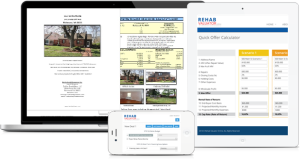 I just bought your rehabvaluator.com premium tonight and started tonight with your building New Construction Rentals Training. I am real excited at this training as you are doing an awesome job with your constuction projects and want to pattern after you. Glad I spent the money with you. I am going to watch every single training you have. Thank you for putting this training site together for us. I am in New Orleans, Louisiana Market. You stated at the end of your video that if we are not in the same market that you would be willing to share your duplex building plans and want to know if I could get an pdf copy emailed to me? I wanted to thank you again for all your wonderful information,I have enjoyed it a lot, I had not thought. Thanks again. I like the demonstrations for building new constructions, apartments esp for rental property ongoing income for furure investments. This may be my niche. Thanks again for this great presentation. We are happy that you are finding our content to be so helpful. Please reach out if you need anything.